It’s been 2.5 weeks and our house is starting to feel like home. Sort of. 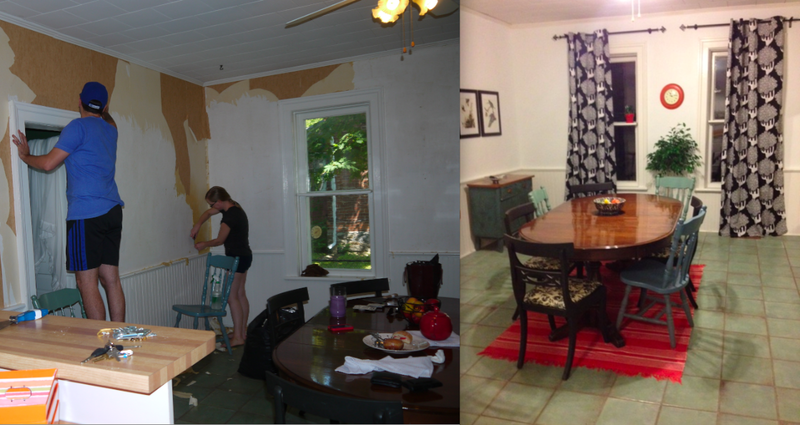 We’ve finished de-wallpapering, painting and unpacking two out of 13 rooms. 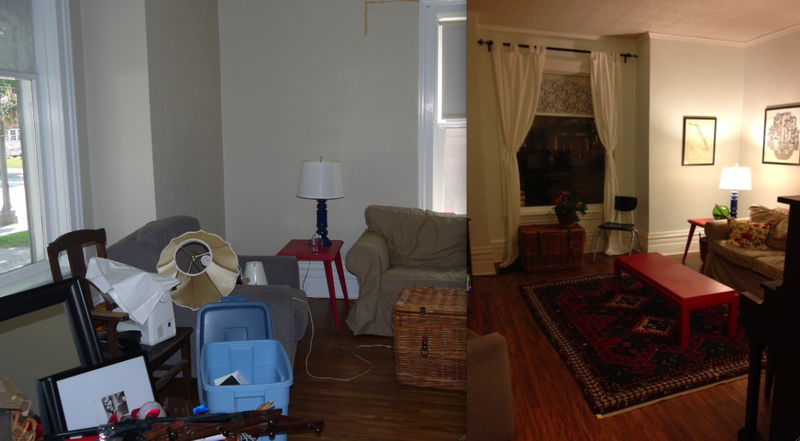 Two important rooms — the kitchen and living room — but that is still a measly 15% of the spaces in our house. The good news is, we’re really enjoying that 15%. Tonight we sat on the couch and surfed the internet for several hours. That was great. The bad news is, the rest of the house is in shambles. Pockmarked walls, smelly grey carpet, and a few sticks of furniture. I generally pretend those parts don’t exist. Or I attack them with spackle in the hope that they can soon be painted and prettied up. 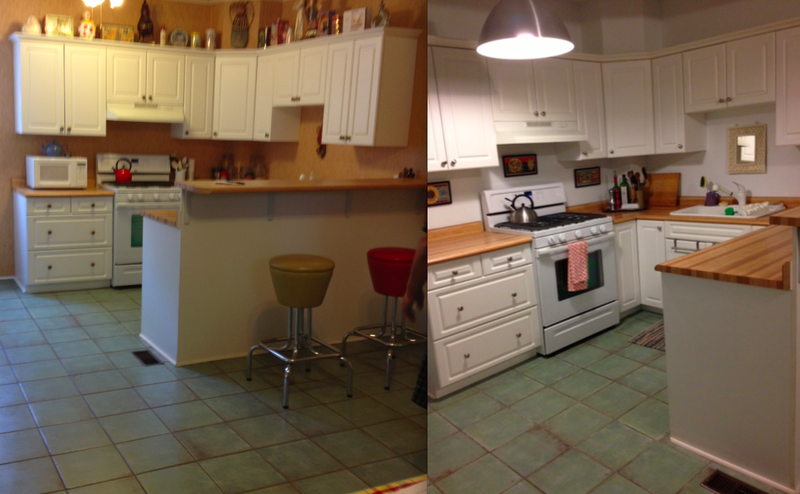 Dining area (in the kitchen) before and after. I need a bigger area rug. I don’t think I’ll ever claim the main bathroom and damp basement as ours. They might be lost causes. I say THE Toronto apartment because, as of August 31, it is no longer OUR Toronto apartment. Aside from the baby squirrels that currently live on its dining room windowsill, it’s vacant. And soon, someone new will take over the lease. Generally, we haven’t had any time to ponder the deep, existential, seismic change that empty apartments represents. We haven’t even cut our lawn yet. I’m waiting for that “holy crap this is real” moment. In the meantime, we will keep trying to enjoy our new life while chipping away at the monstrous project we started when our mortgage went through. This entry was posted in Country vs City, Decorating, House, Lifestyle, Renovations and tagged apartment, Furniture, Home and Garden, home ownership, Moving, painting, Renovation, Toronto, unpacking, wallpaper by Mikaela Lefaive. Bookmark the permalink. Wow Mikaela, you & JF have done an amazing job! The house looks amazing! In such a short time frame too…. Mikaela tu devrais venir travailler sur notre maison….en 2 semaines vous avez plus accomplie que nous en 6 mois ! Oh, Mikaela… you played our wedding song…. it is still nice to hear it, 31 yrs later! and sooo true. House looks great too!